HMS Victory of the Royal Navy is the oldest commissioned warship in the world and has a dual role as the flagship of the Commander-in-Chief Naval Home Command and as a living museum. She was launched in 1765 at Chatham Dockyard and was commissioned in 1778. HMS Victory is well known for her role in the historic Battle of Trafalgar in 1805 as the flagship of Admiral Lord Nelson. In 1812, she was taken out of frontline duty and was anchored in Portsmouth Harbour. She remained at her moorings in Portsmouth Harbour for the next 110 years to meet practical and ceremonial roles. In 1922, to ensure her safety she was moved into Portsmouth’s Royal Naval Dockyard and placed in No 2 Dry Dock. Thereafter continuous efforts are going on to restore her to ‘fighting’ 1805 condition. The Royal Navy is not willing to part with the 243 year old HMS Victory and she will continue to be part of the Royal Navy.The ship will not be decommissioned and hence is not for sale also. In the coming years, maintenance cost of HMS Victory will be enormous to maintain her material state. To sustain HMS Victory as a museum ship and as a commissioned Royal Navy warship, the Royal Navy considers the following options to source the necessary funds. public ownership by another Government Department or Non Departmental Public Body. a new independent Charitable Organization, either a company limited by guarantee or a charitable trust; or an existing Charitable Organization. maintaining the current status quo. was born on 29 September 1758 at Burnham Thorpe. the Royal Navy joined the 1805 Club in celebrating Admiral Lord Nelson’s 250th birthday in his birthplace of Burnham Thorpe from September 26 to 28. 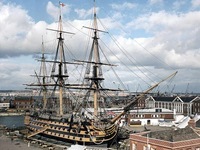 Here is ‘How to visit HMS Victory in No 2 Dry Dock at Portsmouth’s Royal Naval Dockyard’. Read more about HMS Victory here. You can take a tour of HMS Victory, through this interesting video clip. Above photograph of HMS Victory is from the Royal Navy and the above Admiral Lord Nelson’s logo is from 1805 Club.